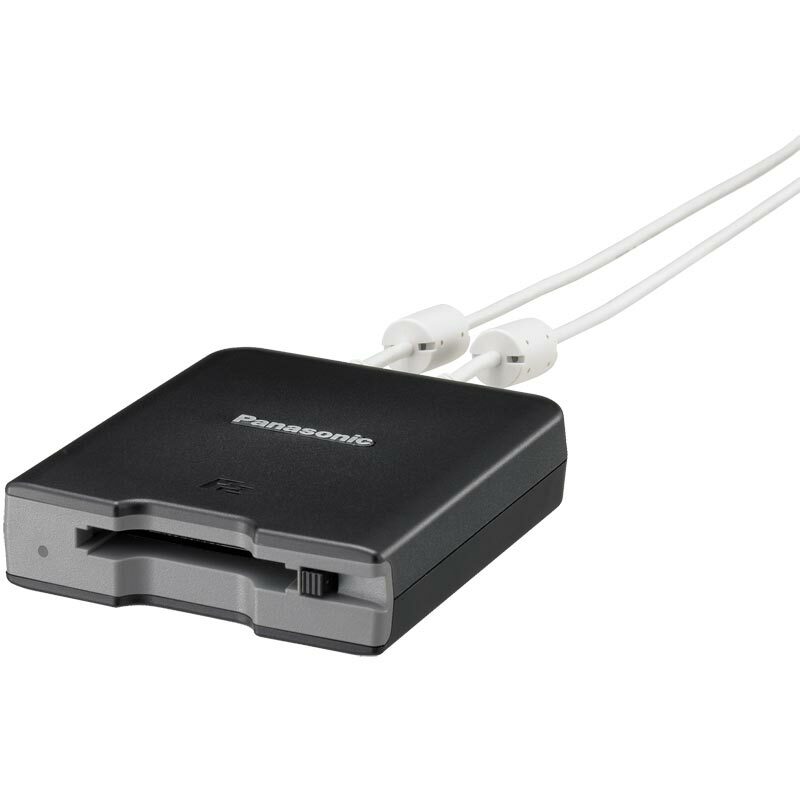 The AJ-PCD2G Memory Card Drive is a compact, lightweight, low-cost 1-slot P2 drive. This compact device is driven by bus power from a USB 2.0 interface. It enables space-saving, high-mobility operation when combined with a laptop PC or a MacBook. The AJ-PCD2G loads data from a P2 card at a transfer rate of 30 MB/s,* and comes with driver software for both Windows (XP/Vista/7) and Mac OS X (10.5/10.6). *The 30 MB/s transfer rate is the maximum rate. The actual transfer rate may be lower due to various factors, such as the file being transferred, the performance of the system (computer/OS) used, the application software and the P2 card version. The AJ-PCD2G is the first P2 drive to operate on USB bus power, thanks to its low power consuming design. Connecting to a PC or a Mac with USB cables (2 cables), with no power adaptor required, it offers excellent mobility and operational versatility. * One cable for data transmission and power supply, and the other cable exclusively for power supply. The AJ-PCD2G is only 25.5 mm (1-1/16ÃƒÂ¢Ã¢â€šÂ¬Ã‚Â) thick and weighs 200 g (0.4 lbs). It is also relatively inexpensive, and can be used conveniently in the field or on a desktop. The AJ-PCD2G is provided with driver software for Windows (XP/Vista/7) and Mac OS X (10.5/10.6), and supports the latest video applications for nonlinear editing and other tasks. The AJ-PCD2G is capable of loading data from a P2 card at a transfer rate of 30 MB/s*. :* The 30 MB/s transfer rate is the maximum rate. The actual transfer rate may be lower due to various factors, such as the file being transferred, the performance of the system (computer/OS) used, the application software and the P2 card version. The following improvement is enabled by this update.